2019 INFO Will be added soon. 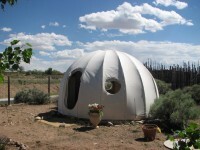 Experience different styles of small area urban living when you tour Tiny Homes, a Geodesic Dome, and a PleniSphere. We are pleased to welcome back Southwest Tiny Homes, and excited about introducing these new exhibitors: Dome Creations, PleniSphere, and Clear Creek Tiny Homes. “Tiny home living” is eco-friendly, leaves a smaller footprint, and allows you more time to experience life, family and friends—rather than simply working to pay a mortgage. This year Southwest Tiny Homes joins the Albuquerque Home & Garden Show. Based in sunny New Mexico, Southwest Tiny Homes is owned by Steve Villines, who has over 40 years of experience as an accomplished custom home builder and remodeler. One of Steve’s Tiny Homes was featured on Tiny Home Nation (episode aired July 23, 2016). The company offers 12 floor plans to choose from, but clients may also custom-design layouts to fit their own needs and desires. All Southwest Tiny Homes are built on a solid trailer foundation. Preferring construction using steel frames for strength and durability, these Tiny Homes are customized to your specifications and custom design choices include layout, type of roofing, siding, interior flooring, wall covering, appliances, color schemes, and more. The homes we design and build are meant to simplify your life! Tour a house on display in Hall B. A PleniSphere® is a stylish, durable, non-toxic canvas home suitable for full-time or part-time use anywhere from Alaska to the tropics. And it is so much more. It is a place where beauty, wholeness and communication happens, where your creativity is balanced and your health soars. A place where you have uninterrupted contact with the continuum of nature, both as an observer and as a participant, while still maintaining essential modern comforts of key furnishings, appliances, media and music. Its ingenious 10' tall architecture of arches framed in PVC yields a dwelling that withstands 80 mph winds, keeps you dry in torrents of rain, melts off the snow as it lands, and gives you respite from heat in the summer. Its round shape, free of sharp angles, replicates structures of nature and galaxies, allowing your nervous system to sink into profound states of peace and joy, naturally. Beyond physical comfort, these canvas castles bring you plenty on all levels, they bring you plenitude, hence its name, PleniSphere®. Reduce your carbon print to near zero and increase your connection with nature exponentially by placing it in your backyard or off-grid land. We will show you how to live sustainably in abundance and luxury, completely off the grid and harming none. Welcome to a sphere of plenitude! Come see it in Hall C (Booth #1102). Belgard® Hardscapes, the nation’s leading supplier of landscape pavers and wall block, is excited about featuring the Belgard Mobile Showroom at this year’s show. The Belgard Mobile Showroom is an inspirational and interactive display where both homeowners and landscape professionals can view Belgard’s latest outdoor living innovations. Belgard’s premium interlocking concrete pavers, wall block and elements--such as fire features, outdoor kitchen items, garden walls and more—will be on display to showcase the latest products, styles and ideas. Staff from Buildology and some of our other landscape exhibitors will be on hand to answer questions about the products.